Inspired by the true story of a legendary 25-foot man-eating crocodile comes the intense, terrifying horror movie Primeval, starring Dominic Purcell (TV's Prison Break) and Orlando Jones. An American news crew, determined to capture this voracious monster and stop his demonic rampage, travel deep within the darkest reaches of Africa to hunt their prey. But Gustave, as the natives call him, is also on the hunt - always on the move, always elusive, always hungry for human flesh. Heart-pounding fear is nonstop in this edge-of-your-seat nail-biter about the cunning killer who continues to blaze his blood-soaked trail of terror! $6.792 million on 2444 screens. Usually when we see a movie with the phrase “inspired by a true story”, we get something serious and dramatic. 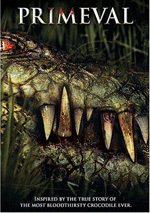 A horror flick about a killer crocodile’s rampage doesn’t sound like a match for an effort “inspired by a true story”, but that’s what we get with 2007’s Primeval, a film that claims to use reality as the backdrop for its events. Primeval takes us to Burundi in Central Africa. A representative of the UN named Dr. Cathy Andrews (Erica Wessels) investigates a mass grave, but she finds more than just another slaughter in another war-torn nation. Some form of enormous beastie attacks and drags her to her demise. A newspaper montage reveals the killer croc’s name to be Gustave. From there we shift to New York to meet cable newsman Tim Manfrey (Dominic Purcell). His boss pairs him with animal reporter Aviva masters (Brooke Langton) to get some good footage of Gustave – and capture the reptile. Tim doesn’t want to do the story, but he agrees to get out of hot water related to some sloppy journalism. Tim, Aviva, cameraman Steven Johnson (Orlando Jones) and herpetologist Matt Collins (Gideon Emery) head to Burundi to take on Gustave. They meet up with Jacob Krieg (Jurgen Prochnow), a hunter who will act as their guide. The movie follows their adventures in pursuit of Gustave along with connected complications. When Primeval landed on my door, I thought it was a direct-to-video effort. It sure had the cheap, exploitative feel of those kinds of flicks. Imagine my surprise when I did some research on the movie and found out it actually enjoyed a theatrical run in early 2007 – and a pretty wide one, too. This wasn’t one of those “showed on three screens for 20 minutes” deals; it appeared on more than 2400 screens during its opening weekend. Where was I? Blissfully ignorant, obviously, and now that I’ve seen Primeval, I wish I’d stayed that way. Look, I don’t ask much from a flick like this. I certainly don’t expect a classic. I just want some decent thrills and a story that maintains my interest to at least a moderate degree. No such pleasures crop up during Primeval. 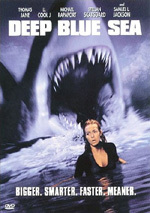 Has a monster movie made since 1975 not owed a debt to Jaws? Perhaps, but not many, if any can make that claim. Primeval reveals its inspirations more than most, especially when we look at the Collins and Krieg characters. They’re little more than minor variants on Hooper and Quint. No direct Brody clone appears, but the message remains clear: the folks behind Primeval wanted to make a reptilian version of Jaws. If you want to follow the Jaws model, at least through out the occasional exciting sequence. That flick took quite a while to move toward the meat of its action, but it dolloped out more than enough excitement and character drama to keep us involved. In this case, unfortunately, the movie takes forever to go anywhere but doesn’t use its time well. Indeed, I find it hard to think of many other really short flicks that feel quite so padded. Not content to tell a simple man vs. beast tale, Primeval throws in plenty of extraneous elements. Indeed, the story spends more time with its African warlord subplot than it does with the killer croc. Perhaps someone thought this would add depth and heft to the movie, but instead, it just leaves us with a confused, muddled flick. Primeval offers oodles and oddles of prep work. Way too much prep work, as a matter of fact – so much that it makes the flick seem even more padded. The exposition adds nothing other than boredom to an already dull movie. Add to that scads of plot holes and nonsensical choices to make matters even worse. If Primeval generated some interesting characters, I might be able to get past the confused story. It flops in that manner as well, unfortunately. The roles seem one-dimensional at best and never rise above the stiff genre stereotypes. Jones does manage a few funny lines, but the usual wacky black sidekick role gets tiresome. I did feel bad for Jones, though, as he’s actually stuck with a “joke” in which he says that slavery was a good thing! I could say the same about all of Primeval. This is a messy, uninspired monster movie that wants to be another Jaws - or another Hotel Rwanda, as it’s not sure which. Instead, it's much more reminiscent of 1997’s terrible Anaconda. Cheesy, boring and completely free from tension or excitement, Primeval is a dud. 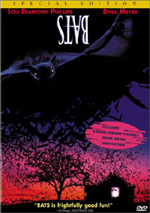 Primeval appears in an aspect ratio of approximately 2.35:1 on this single-sided, double-layered DVD; the image has been enhanced for 16X9 televisions. No issues cropped up in this solid transfer. From start to finish, sharpness looked very good. No issues connected to softness materialized, even though a lot of wide shots appeared to create potential problems. Instead, the flick stayed concise and tight. I saw no jagged edges or shimmering, and edge enhancement appeared to be absent. In addition, source flaws failed to mar the presentation. Like most movies set in Africa, Primeval went with an earthy palette. This meant a brownish-red tint much of the time, though some other tones also poked through at times. Within the stylistic constraints, the colors seemed accurate and well developed. Blacks appeared dense and deep, while low-light shots offered good clarity and smoothness. All in all, this was a terrific visual effort. The Dolby Digital 5.1 soundtrack of Primeval also satisfied. With the movie’s gunfights and croc attacks, it generated a lively soundfield with many effective moments. All five channels managed to offer well-defined elements that spread out the spectrum in a solid manner. The surrounds kicked in lots of material as well to make this an engulfing affair. Audio quality was strong. Speech seemed natural and concise, with no edginess or other problems. Music was lively and dynamic, while effects sounded clear and accurate. Bass response came across as deep and firm at all times. This was a consistently excellent soundtrack that almost made the movie tolerable. In terms of extras, we start with an audio commentary from director Michael Katleman and visual effects supervisor Paul Linden. They sit together for a running, screen-specific discussion. The chat looks at cast and performances, sets, locations and shooting in Africa, visual effects and stunts, story, editing and changes to the script, production design and a mix of anecdotes about the production. Despite a few dry spots, this turns into a pretty interesting track. Katleman and Linder offer a nice sampling for fun stories from the shoot, and they offer enough details about various elements to make matters worthwhile. This never becomes a great commentary, but it’s worth a listen. Next we find a featurette called Croc-Umentary: Bringing Gustave to Life. This nine-minute and 38-second piece mixes movie clips, behind the scenes materials and interviews. We find notes from Katleman, Linden, visual effects supervisor Vincent Cirelli, visual effects artist Justin Johnson, actors Dominic Purcell, Orlando Jones, and Gideon Emery, and other unnamed personnel. Oddly, the program never lists the names of the participants, so I relied on some subtitle attribution and simple recognition to get the names. Short but sweet, “Life” provides a very nice look at how the filmmakers created the movie’s croc. We get good details about the elements involved, and we find a lot of interesting footage to accompany these notes. We see crude renderings, pre-effects plates and other pieces that demonstrate the work. It’s a solid little show. Three Deleted Scenes fill a total of five minutes, 40 seconds. We locate “Pigman” (1:57), “Shower” (0:51) and “Harry’s Death” (2:52). In a strange choice, we can’t watch these with any audio other than commentary from Katleman and Linden. They give us good notes to explain a little about the scenes and tell us why they cut them. However, as silent pieces, the scenes don’t always make sense. “Death” is fine without audio, but “Pigman” has too much chat to be worthwhile in this form. I guess we don’t need sound for “Shower”, but I’m bitter than the film dangles a potentially naked Brooke Langton and doesn’t show us any skin. Anyway, the deleted scenes are moderately interesting but lose power due to the lack of natural audio. The disc opens with some ads. We get promos for Ratatouille, Renaissance and The Lookout. These also appear in the Previews area along with clips for Apocalypto and Roger Corman flicks. No trailer for Primeval shows up here. If you want to see a slow-paced, tedious monster movie, Primeval is for you. If you’d prefer something with wit, tension and/or excitement, look elsewhere. The DVD presents excellent picture and audio along with some decent extras. Skip this dismal stinker and watch Jaws instead.